Teddy Bridgewater capped off his final game of the 2013 season with perhaps the best game of his career, throwing for 447 yards and accounting for four total touchdowns. ORLANDO, Fla. — Teddy Bridgewater has no regrets about his decision three years ago to de-commit from the University of Miami and head instead to Louisville. But following a career-best performance Saturday night in what could well be his final game before declaring himself eligible for the NFL Draft, there was one thing the junior quarterback wished he could have taken back. "I would just like to apologize to the University of Miami and their fans and their team," Bridgewater said, referring to a couple of mocking gestures he made during the Cardinals’ 36-9 victory in the Russell Athletic Bowl. By no means is he the first player to ever take the Hurricanes’ famous "U" hand signal and throw it in their faces. But to do so, even if he never got penalized for it, after Louisville had pulled comfortably ahead clearly gnawed at his conscience. "You can’t get too caught up in your emotions," Bridgewater said. From strictly a football perspective, it would have been difficult for anyone not to get carried away with how sharp Bridgewater looked. He completed 35 of 45 passes for 447 yards with three touchdowns and no interceptions. His last pass — a 25-yard completion to another native of Miami, wide receiver Eli Rogers — allowed him to top his previous career-high showing of 424 yards in a loss last season to Syracuse. Bridgewater also obliterated the record for the most passing yards against the Hurricanes in a bowl. Rex Grossman of Florida set that with 252 yards in the 2001 Sugar Bowl. So much for saying earlier in the week that Miami was just another opponent to him. Takeaways & observations: Ken Hornack takes a closer look at what happened during the Hurricanes' loss to the Cardinals. 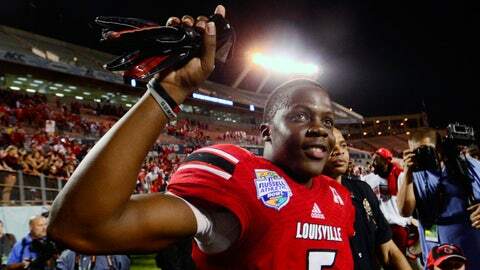 Recap: Teddy Bridgewater caps a sensational season with a stellar performance agiainst Miami. "It meant a whole lot," Bridgewater said after the Cardinals’ 12th victory in a season marred only by a three-point loss to UCF. "Not only were some of the guys from the state of Florida going up against our hometown school, but we were going against a quality opponent, a decent opponent. We’ve already heard that our schedule wasn’t good. But that’s why you play the game, to compete." While Miami coach Al Golden was not in any sort of mood to evaluate Bridgewater’s future, he sounded almost as impressed with his elusiveness as his arm strength or accuracy. Aside from a safety which gave the Hurricanes a 2-0 lead barely more than three minutes into the game, Bridgewater was never sacked. There was even a 15-yard run by him to end the first quarter, a gain which was longer than anything Miami managed on the ground all night. "He made some really, really excellent individual plays where it looked like we had him for a sack," Golden said. The Cardinals ran off 36 straight points and needed to punt just once all game. In contrast, the Hurricanes failed on all 11 of their third-down conversion and finished with only 174 yards of total offense. Stephen Morris completed fewer than 50 percent of his passes and was sacked four times, one of which resulted in a fumble deep in Louisville territory. It was clearly not the way he intended to wrap up a four-year career in which he stuck it out despite Miami’s self-imposed bowl sanctions. "Despite that, I’m really proud of Stephen and this group of seniors and what they’ve been through and what they’ve endured in moving us forward from six to seven and from seven to nine wins," Golden said. "We’re going to miss them greatly." Morris’ pro prospects are nowhere as glowing as those of Bridgewater, who is projected as being no worse than a top-five selection. Where Morris goes from here is a mystery to him. "It’ll probably hit me when I wake up and I won’t have a schedule from coach Golden or I won’t have a text saying where I need to be," he said. "It’s been a pleasure here. It’s been a true blessing." 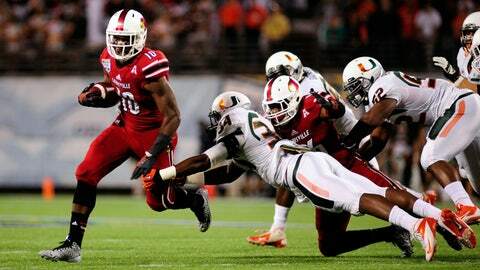 Golden hopes that when Louisville joins Miami as a member of the Atlantic Coast Conference next season, the Hurricanes will be more competitive. It sure would help if Bridgewater was in Jacksonville, Houston or someplace else in the NFL. "We’re not where we want to be yet," Golden said. "But we’re scratching and fighting and clawing to get to where we want to be. We’re moving forward. And we’ve done it against terrible odds."